Amos Nananko salim hello blo em ikam long yu, Amos laik yu mas kam hariap, em missim yu stret. Translation: "Amos says hello. Amos wants you to come back soon, he really misses you." 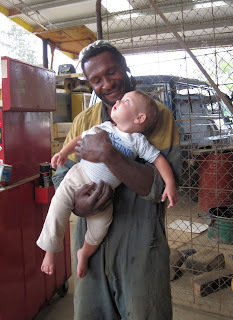 Amos with Greg when he was about 11 months old. It's always nice to know that you are missed, and this email made us miss PNG. Amos is one of our favorite PNG friends. We are really looking forward to going back. Our time in the US has been wonderful and refreshing, but we feel ready to get back to work in Ukarumpa! Did you know that we have already purchased our tickets to return? The departure date is August 7, Lord willing. Most of our preparations for returning are going smoothly. The only thing left is for us to complete our financial support team. We still need commitments totaling $250 per month in order to get permission from our organization to get on that airplane in August. Would you join us in praying that this need would be met? If you are interested in joining our financial support team, you can give through Wycliffe's website here.